Silver started to drop into a long lasting correction a year ago on the 4th of July, 2016. Below is a comparison chart of three stocks and silver itself to show you how they performed relative to each other. The metal (black line with the pink area) lost almost 20% from the top, two out of three stocks lost even more: CDE (blue line) – 28% and SSRI (red line) – 31%. Coeur Mining has a wild chart line with abrupt reversals, but it finally calmed down and followed the metal’s trajectory to the downside. Silver Standard Resources was easier as the price was pushed down harder than Silver's price from the beginning. Only one stock made its own path, hitting a new high amid silver weakness and staying above water at the end of the period with a 3.7% gain. The name of the company is Silvercorp Metals Inc. (green line). This penny stock became a superstar starting from below $1 and hitting more than a ten folds gain at the peak this year (see chart three below). I’ve added separate charts of all three stocks in the order of their performance for the past year, and amazingly it coincides with their rankings by P/E shown in the table above. All three stocks have different chart structure, so it is worth taking a look at all of them. 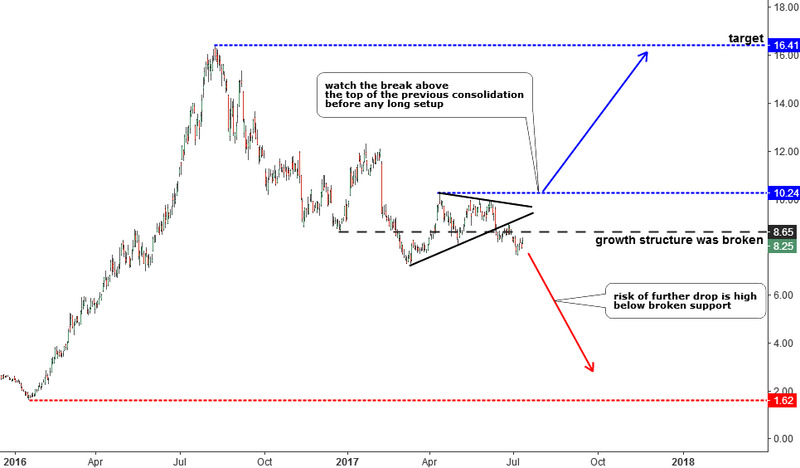 This chart doesn’t copy the structure of the silver market. It has a higher top, and the growth structure is still valid as long as the price is above the invalidation point at the $2.07. Currently, Silvercorp Metals Inc. (NYSE:SVM) is moving to the downside within the red downtrend. A series of multiple troughs started this May around $2.7 mark show that the stock is uneasy to drop further as buying interest appears at the dips to that level. This month the price is consolidating around the $2.8 point with the margins at the $2.7 and $2.9 marks. It could drop further as highlighted with the red down arrow, and we should watch the $2.07 mark to see if it will be breached if it is the structure would change implying further weakness ahead. 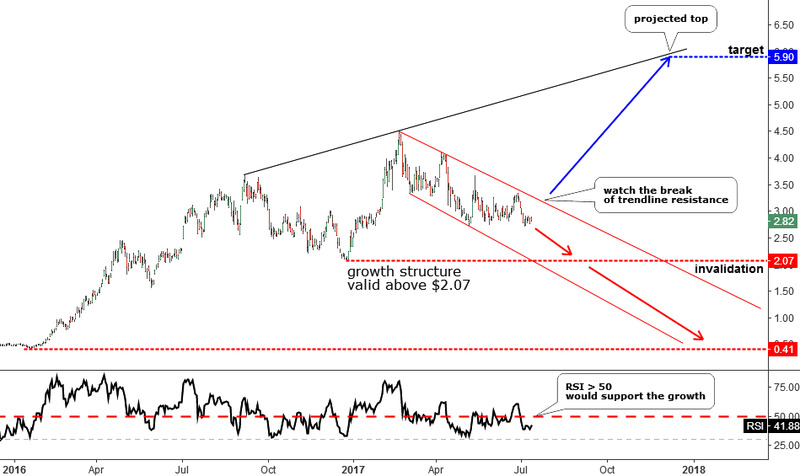 A break above the downtrend’s resistance around the $3.3 level could spur investor demand, and we should pay attention to the RSI sub-chart, the indicator should break above the 50 level to support the growth. The target is located in the $5.90 area where the projected top (black line) is located. I didn’t put the previous top as the structure of the price action is stronger than silvers. 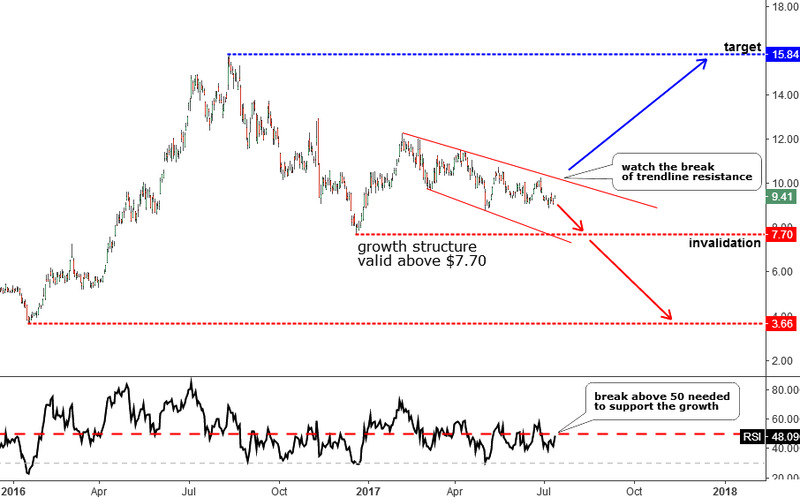 Coeur Mining Inc. (NYSE:CDE) finished in second place, but despite that, it repeated Silver's price action breaking below the growth structure invalidation point located at the $8.65 mark unlike the rest of the analyzed stocks. Besides that, the price already finished the consolidation contoured within the black triangle and dropped further. The one thing that is different – the price didn’t establish a new low amid Silver's flash crash. As long as CDE is below the broken point, the chances of further drop remain high. The long setup could only appear when the price breaks above the triangle’s upside established at the $10.24 mark. The conservative target could be set at the previous top at the $16.41 mark. Silver Standard Resources Inc. (NASDAQ:SSRI) has a solid growth structure as the price is above the $7.7 mark. It looks like SVM but has a strong RSI, which approached the crucial 50 level, the price itself is closer to the downtrend’s resistance, and it is sitting above both major low and previous low. Watch $10.25-$10.35 area for potential break upside, which should be confirmed with the RSI above 50 level. The conservative target is set at the major top area at the $15.84 mark. Which stock do you prefer? Please take a moment to leave your comments to share your thoughts about these stocks.